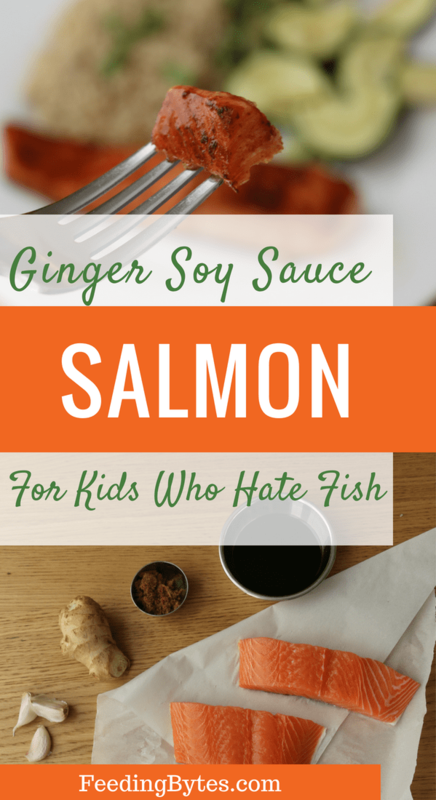 This ginger soy sauce salmon recipe is a game changer when it comes to kids who hate fish or adults who are bored of the old plain roasted version. It is packed with so much flavor and smells so amazing, very few people I know ever said “no” to it. And most of them were under 5 :). But still, fish can be a hard sell to kids and even some adults. I have a confession to make: two of my older kids do not like white fish. They used to eat it by pounds when they were younger but now they rarely touch it. I still make it regularly because my husband, I and our 3-year old are big fans, so hopefully, things will turn around for our Miss 12 and Miss 9. But salmon is a definite crowd pleaser for our family. I have been preparing it this way for years, it rocks on some cedar planks on the grill but also tastes delicious when made in the oven. 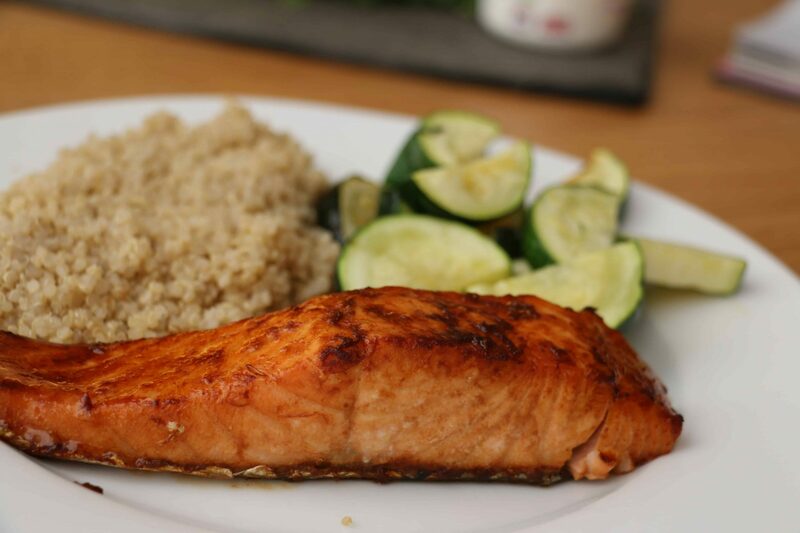 1/ The magical perfectly balanced marinade that highlights the best about salmon. It includes a little brown sugar that is absolutely essential, so please do not omit it. 2/ Skin-down method of marinating, which allows the marinade to penetrate as deeply as possible into the fillet and infuse it with wonderful flavors. 3/ Two-step preparation process, where the fish is first roasted in the middle rack of the oven and then is quickly grilled, or broiled, on the top, just for a couple of minutes, to give it beautiful caramelized crust. And of course, I use shortcuts to make it easier for myself. To cut on washing up, I make a little mini tray out of foil, where I marinade and then cook the fish. For cooking, I place it on a baking sheet next to some sliced and seasoned veggies so I get a whole one-tray meal at the same time it takes to cook fish. Preheat the oven to 200C/390C. Mix the soy sauce, rice vinegar. brown sugar, grated ginger, and garlic, in a bowl. Make a small tray out of foil, just big enough for the fillets, leaving about 1-inch space between them. 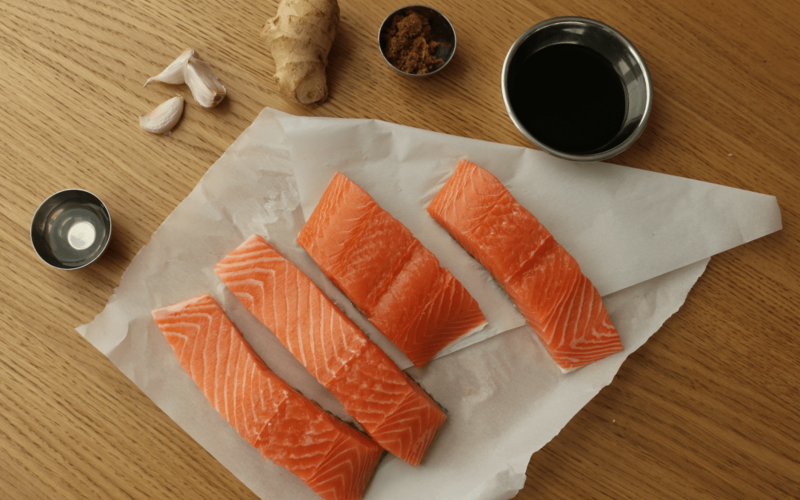 Place the salmon into the tray skin down and pour the marinade over the fish. Turn the fish skin up and allow to marinade for about 15-20 minutes. In the meanwhile, place the veggies on one side of a regular size baking tray, mix with olive oil and seasoning and roast in the middle of the preheated oven for 10 minutes. After 15-20 minutes, turn the fish skin down again and brush off the excess ginger and garlic from the top, to avoid burning. 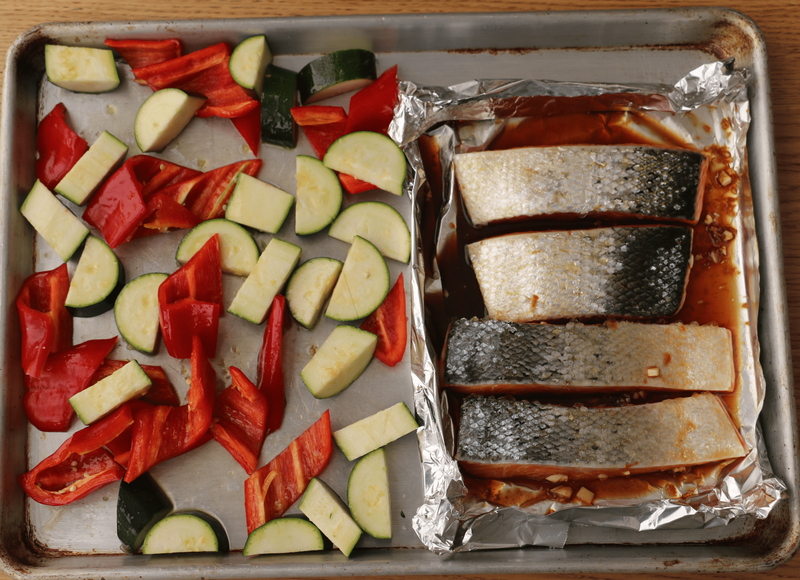 Place the small foil tray with the fish on the regular-sized baking tray, next to the vegetables. Place the baking tray with salmon and vegetables back into the oven for 7 minutes. Turn on the grill setting to 260C/500F in your oven. Place the tray with the salmon and vegetables under the grill for 4-5 minutes. Keep checking after 3 minutes to make sure the fish and the vegetables are slightly caramelized but not burnt. I’ve made this for my family several times and my 4 yo. and 2 yo. love it. I’m so relieved to finally have a fish recipe my kids will eat without complaint. Today I made this for their lunch and I used maple syrup instead of brown sugar. Still turned out just as good. Thank you for this awesome recipe! Wow, thank you so much for sharing your feedback. My kids are also not very fond of fish and I am so happy that yours enjoyed the final result, too! Using maple syrup is a great alternative, will keep it in mind :). i’m a bit confused by all the steps, i’m sorry. By grilling in the oven, do you mean broil?!?!? or does the high temp (500F) change things from roasting to grilling? i’m sorry for the silly questions. Also, in step #6 does the fish go into the oven with the veggies? I don’t think it does but i’m a bit confused. Great questions! I will edit the recipe to make it easier to understand. Yes, grilling = broiling. And the veggies in step 6 go into the oven without the fish, it’s added in 15-20 minutes. This was a perfect, easy recipe. The salmon was cooked perfectly and it was delicious. My toddler and the grown ups all loved it. Yippee! So happy you liked it! It’s honestly my favorite way to eat salmon :). So happy I found this recipe my 4 and 6 year old are pretty fussy and rarely eat fish that is not in finger form. This was great for the whole family, i served it with noodles and had clean plates all round #winning thank you so much!